“Studies have established that once children understand the concept of three it usually clicks for all the other numbers,” says Hilary Barth, assistant professor of psychology. Thus, counting may be tougher than parents realize, but, curiously, arithmetic may be easier than they think. Barth confirmed this with a study, “Abstract Number and Arithmetic in Preschool Children,” published in an issue of the Proceedings of the National Academy of Sciences. The study showed that long before they learn how to add big numbers exactly in school, preschoolers can add big sets approximately. One of Barth’s students, Ariel Ballinger ’07, designed a study based on Barth’s work, thanks to a fellowship from the Hughes Program in the Life Sciences. The fellowship provides a stipend so students can undertake full-time research during the summer. Her study, “Counting, Estimation and Approximate Nonverbal Addition in Young Children,” is a new examination of number approximation in children who have reached different levels of verbal counting ability. Ballinger divided her children into three groups based on counting ability. She found that although counting ability was related to the accuracy of the guesses, even children who could only count to 30 guessed bigger numbers for bigger sets of dots. Ballinger’s study has been accepted for a presentation at a professional meeting. She will present her research at the annual meeting of the Society for Research in Child Development, held in Boston in March. At the same meeting, Barth will present another research project completed with Ballinger and AnjaLi Carrasco ’07, Rachel Jacobson ’08, and Jessica Tsai ’07. 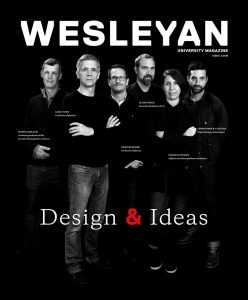 “It’s great to be at a place like Wesleyan where undergrads can get involved with ongoing faculty research,” Ballinger says. Barth’s Cognitive Development Lab is always looking for new participants. Interested people may visit the lab Web site at www.wesleyan.edu/cdl, call 860/685-3588, or e-mail cdl@wesleyan.edu.